INSTA-SCENT ULTRA Liquid Concentrate Air Freshener, (In Production Since 1986). INSTA-SCENT ULTRA Cost Less Than Pennies Per Application. Just One 6 Ounce Bottle Makes a Full Gallon of High Quality Long-Lasting Air Freshener. Perfect for Car Washes, Detail Shops, Janitorial Services, Home, Office etc. Don't settle For Weak Liquid Air Freshener Concentrates. INSTA-SCENT is ULTRA Concentrated With a High Percentage of High-Quality Long-Lasting Aromatic Fragrances. We've been using Insta Scent Ultra for several years, and are very satisfied with this product. It is so much easier to mix myself than getting the premixed gallon jugs. I can customize the potency for picky detailing customers by adding just a bit more of the Insta Scent concentrated liquid to a gallon of water. We have several automatic carwashes, and offer customers a fragrance choice with each wash. We switched to insta-scent liquid concentrate from another pre-mix brand. 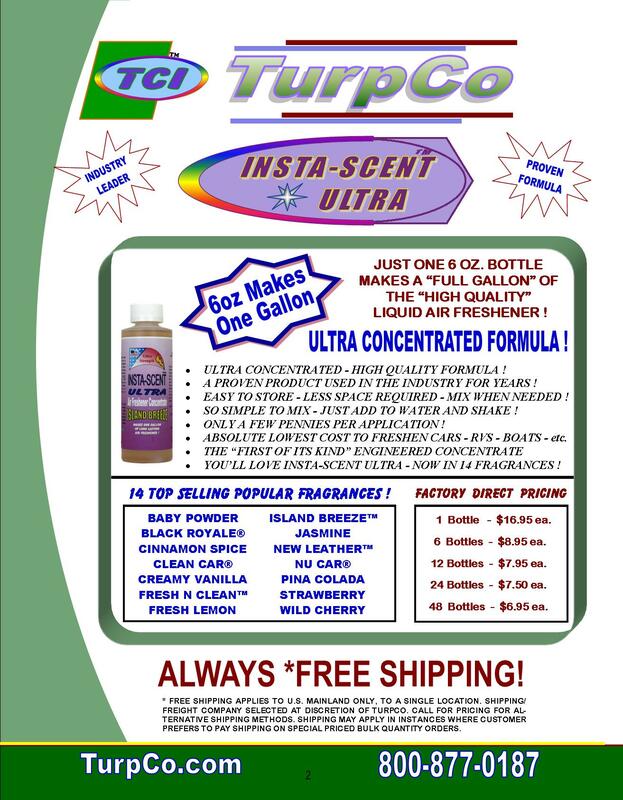 Insta-scent saves us money, especially with TurpCo's "free shipping". We are paying just $6.95 a gallon by mixing it ourselves. Q: Your company shows 14 fragrances that the insta-scent ultra and supra come in. Can I get other wonder wafer fragrances in liquid form, like Pine, Cotton, or European leather? A: Great question, Yes we can supply any of the 32 Wonder Wafer fragrances in Insta-Scent Ultra or Supra 16 liquid concentrate. We currently offer 14 of the most popular fragrances. The remaining 18 fragrances can be special ordered with a minimum ordered quantity. Q: Can I wipe my dash board and car doors with this without mixing it? I just love the smell. It is Not recommended to use INSTA-SCENT liquid concentrate for a purpose other than it was designed for. It shouldn't be used on Dashboards, Doors, or other such interior surfaces...especially in its concentrated form. Please read all CAUTION:, DIRECTIONS:, and WARNING: labels on all products before use. Below is an excerpt from the INSTA-SCENT ULTRA label. There is always the possibility that liquid air fresheners can stain or damage if they are not applied properly. You can greatly reduce this chance by carefully spraying any and all brands of air fresheners UNDER THE FRONT SEAT INTO THE CARPETING. DO NOT spray liquid air fresheners on any visible carpet area, floor mats, dashboard area, doors, seats or headliners. Permanent damage or staining can occur. Pour entire contents of one to two bottles (depending on the level of fragrance strength desired) into a clean one gallon container. Place hose in bottom of gallon container and fill slowly with fresh water. Screw cap on gallon container and shake well until dissolved. Apply 8 to 12 sprays of the finished product into the carpet area under the front seat using an all-purpose spray bottle. KEEP OUT OF REACH OF CHILDREN! Not for internal use.